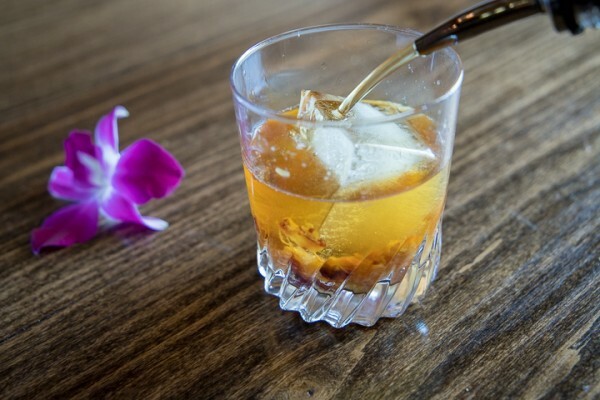 The Rum Fashioned features the tropical flavors of Tiki in Old Fashioned style. 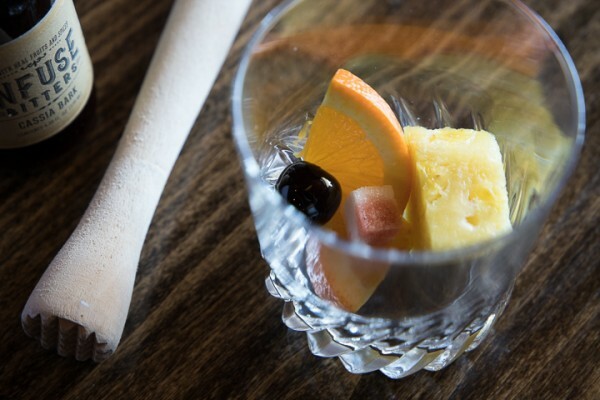 The classic Old Fashioned cocktail is made by muddling sugar with bitters then adding whiskey, usually bourbon or rye, and served in a short, round “Old Fashioned” glass over ice. Most often you’ll find orange and cherry muddled in as well, and perhaps a splash of club soda. This recipe calls for the same method, but to give it a fun makeover we will borrow a few ingredients from the Tiki arsenal. If you’re curious about Tiki culture you can read more about it here. First, rum! The selection of rum is important and can be altered to suit the drinker’s preference. 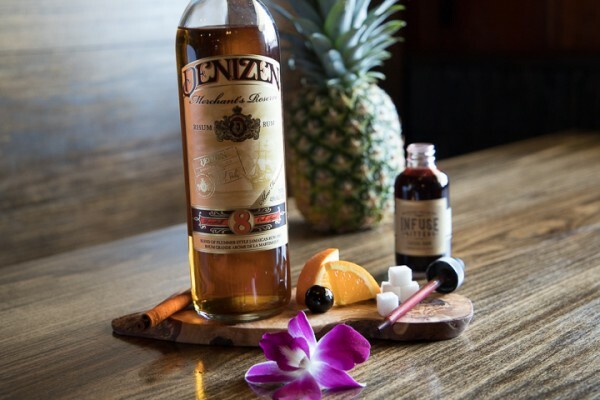 A good blended rum such as Denizen Merchant’s Reserve works best as blended rums lend the cocktail subtle tropical notes while keeping the oaky tradition of the Old Fashioned. We’ll infuse the muddle with fresh pineapple, and we’ll add a little spice in the form of cinnamon bitters and a touch of ginger brew. Denizen Merchant’s Reserve is aged for 8 years in once-used American Oak bourbon barrels giving this sipping rum a lovely smoothness that is perfect for an Old Fashioned style cocktail. Add the muddled ingredients to the glass and use a muddler or the back of a wooden spoon to press and twist, releasing all the juices and oils and dissolving the sugar. Instead of sugar you can substitute coconut syrup for an added tropical note. Add ice and pour 2 oz rum. Top with a splash of spicy ginger beer for effervescence. 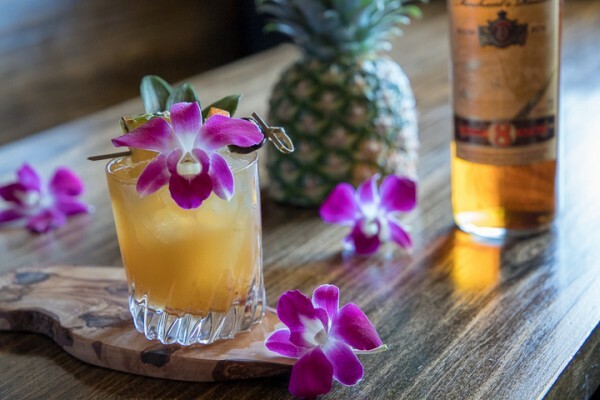 Any type of Tiki cocktail calls for an over-the-top garnish, so be sure to save your pineapple leaves for extra flair. 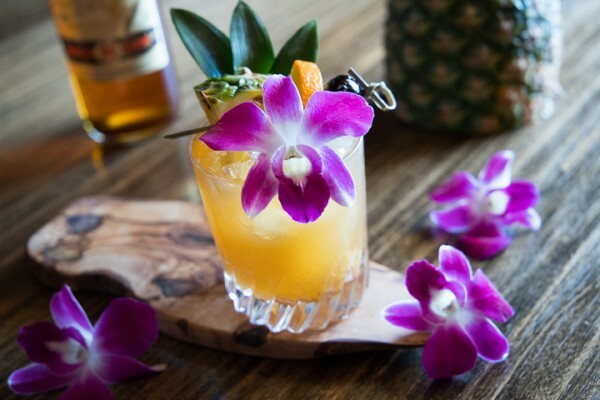 Garnish with pineapple, orange, and cherry on a pick, and add some pineapple leaves and a fresh flower. It’s so pretty you (almost) won’t want to drink it! Here’s something tasty to try next time you visit the craft cocktail bar at Guide House Grill. This Wild Hibiscus Margarita is made with wild hibiscus syrup, house-made sours, and 123 Organic Blanco (Uno) tequila. Uno is a clean unaged “mother spirit” with fresh agave, lemon peel, and black pepper on the nose and a long, smooth, slightly sweet finish. 123 Organic Tequila is an artisan producer of certified organic tequilas made from estate-grown lowland agaves northeast of Guadalajara in Jalisco, Mexico. Ten-year-old, slowly ripened agaves are cooked for two days in traditional stone ovens to concentrate flavor, then double-distilled using a small-batch process. The strange looking garnish on top is an all natural and deliciously edible wild hibiscus flower preserved in a pure cane sugar syrup. All of the natural vibrant color and flavor in the syrup comes just from the flower itself. Isn’t nature beautiful? January is nearly behind us and the Super Bowl is just around the corner. If you’re sticking to your New Year’s resolutions, here’s a game day snack that won’t set you back! Togarashi powder is a Japanese 7 spice blend that includes sansho pepper, red chili pepper, flaked nori (dried, pressed seaweed), black sesame seeds, white poppy seeds, tangerine peel, and garlic. It can be found in the international section of most grocers or purchased online. If you’re in a pinch you can substitute traditional chili powder instead. Zest and juice 2 limes, and set aside. Use a mortar and pestle to grind the red pepper flakes, togarashi powder, kosher salt, and lime zest. Transfer the spice mixture to a ziplock bag and add tequila, olive oil, and 1 Tbsp lime juice. Add cashews to bag and toss to coat. Spread cashews in a thin layer on a parchment lined baking sheet and bake for 5 minutes. Stir the nuts and bake 2 minutes more. Remove cashews from oven and allow to cool completely on the baking sheet. Mix the rest of your lime juice with some tequila and a little sugar, and have a tasty fresh margarita while you wait for your snack to cool. If you don’t consume your cashews right away they can be stored in an air tight container at room temperature for up to 2 weeks. Most people assume that Tiki originated somewhere in the South Pacific, but you might be surprised to learn that the iconic Tiki culture was actually born right here in the United States. In the 1920’s this guy, Ernest Raymond Beaumont Gantt, traveled from his home in New Orleans to the Caribbean with his grandfather’s “import-export” business (importing Jamaican rum during prohibition). During his travels he absorbed every drop of the cultures he encountered— the people, the art, the cuisine, and most importantly, the drinks! In his early twenties Ernest found himself on dry land in Los Angeles with a cargo load of trinkets from his travels. After a couple years of odd jobs he was able to open his own establishment in an old tailor shop in Hollywood. The plan was simple. 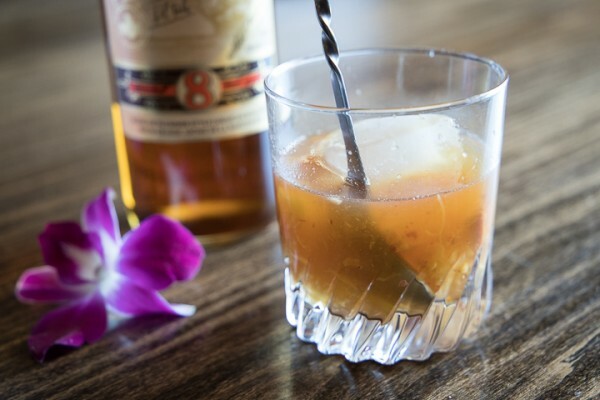 He created his own cocktails from his arsenal of Caribbean rums, tropical fruits, and the spicy flavors of New Orleans. Then he built a bar with 24 seats, tossed up his exotic island trinkets among thatch and bamboo, and hung a driftwood sign labeled “Don’s Beachcomber” above the front gate. Don’s Beachcomber Café was born, and it changed the cocktail scene for the next 40 years. Ernest eventually changed his name to Donn Beach— either to accept the fate of everyone assuming his name was Don, or perhaps to avoid his bootlegging past. The Tiki trend spread like wildfire. The return of WWII soldiers sparked a fascination with Polynesian culture, and the Tiki bar, though not at all authentically Polynesian, provided an exotic escape for post depression Americans who couldn’t afford to travel. Fun fact: Donn’s Tiki drinks were so highly sought after that he developed a secret coding system so that none of his bartenders knew exactly what ingredients they were pouring and therefore couldn’t give away his recipes! Clayton Hauck for Lost Lake / Thank You. Before we start mixing let’s review the anatomy of a proper Tiki cocktail. 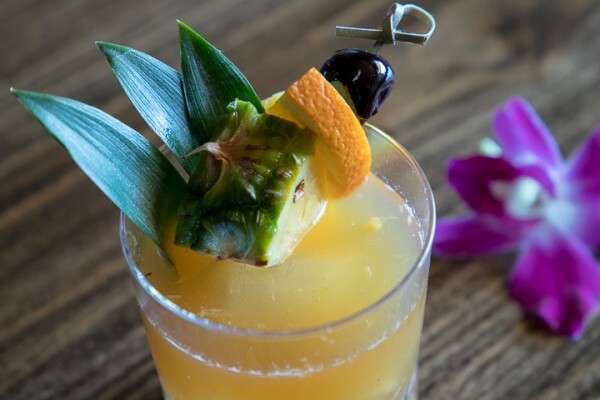 We need tropical flavors and spice in the form of something sour, something sweet, something strong, and something weak, and we must serve it in a fun glass with a larger-than-life garnish. Are you ready for the challenge? I know what you’re thinking. NINE ingredients!? That’s absurd! Perhaps, but we’re talking Tiki, people! This style is known for using lots and lots of exotic flavors to create the perfect balance. Let’s get down to business. Start by filling an interesting drinking vessel with ice. Now for the strong stuff. First, pour 1 oz of an aged blended white rum such as Denizen aged white. Add 1 oz black rum, not to be confused with “dark” rum such as Gosling’s black rum. Now pour 1 oz bourbon such as Basil Hayden’s for funzies. 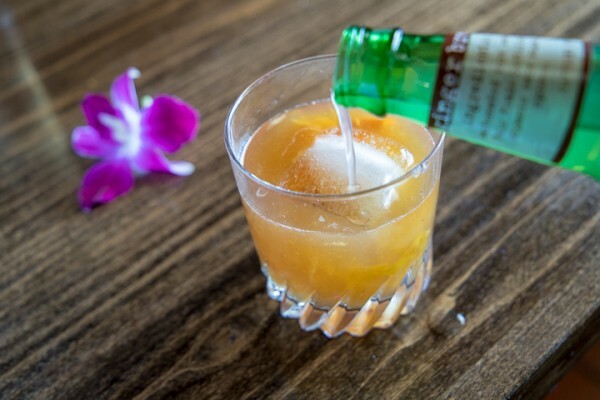 Bourbon is not typically used in a tiki cocktail, but let’s face it. Bourbon makes everything better! Round out the booze with 1 oz orange liqueur such as Cranberry Clementine SweetShine. Pour 1 oz passion fruit juice. Add 3/4 oz pineapple juice. Squeeze some fresh lime juice. Add 1/2 oz fresh lime juice to your cocktail. Pour 1/2 oz orgeat. Orgeat, pronounced “or-zha” like Zsa Zsa Gabor, is a non-alcoholic almond syrup with orange and rose water and is used in many tropical drinks. Finally, add 2 drops of cinnamon bitters. Don’t add too much! 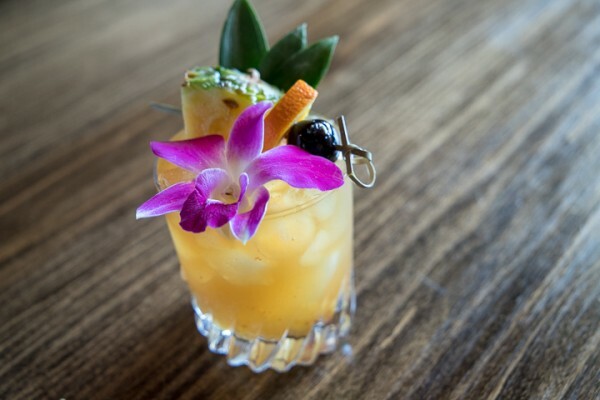 No Tiki cocktail is complete without an over-the-top garnish. Let’s decorate this beauty with pineapple leaves, a pineapple flower with a fresh cherry, some vibrant purple orchids, and a bamboo straw for authenticity. My girl, Martha, will show you how to make pineapple flowers if you click right here. I give you Tidal IX, a delightfully tropical libation with just enough sweetness and a strong boozy kick. The Flavor Lab Blog at WordPress.com.